Columbus found a world, and had no chart, save one that faith deciphered in the skies. You can't learn anything by doing nothing. You can't discover your future by remaining, unmoving, where you are. Make a choice. Decide. Act. Then the Universe will correct your course and point you in the right direction. Meaning is something to discover rather than to invent. The history of the world designs the future of our Journey of Life as it's an amazing discovery with each new day. Think wise, beautiful thoughts. Life is a journey to discover about. See fairly. Believe you'll be on the right track of this society. Be and feel perfect, that all your imperfections within you can't break you. You can't rediscover what you missed in time but you can make better choices for the future. Life is a Journey of Discovery. Every new day presents us with new discoveries, just live the day in the best way you can. 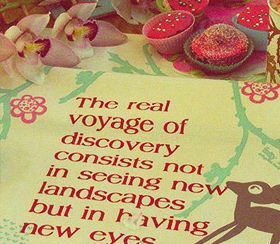 Discovery means the act of discovering a new place or thing which already exists and is unknown. Discovery may be made in the course of a search or even unexpectedly, at times. History has it, that Columbus had discovered accidently. Discovering something accidently is also called serendipity. According to James Joyce, “A man's errors are his portals of discovery.” Discovery is mostly made after making several errors in the research process. In the words of Albert Scent Gyorgi, “A discovery is said to be an accident meeting a prepared mind.” Discoveries are always appreciated because they bring to light some unknown places or things, which exist, but are not yet known. Discoveries require great efforts on the part of the discoverer. A person, who makes a discovery, needs to be a man of intellect and highly persevering. Then, only a discovery is made possible. Great intellectual minds can only bring about discoveries.